Have you had your car checked recently? Have you hit a pothole? Do you think you may need wheel alignment? The Hunter Computerised 4 Wheel Alignment could save you £££'s in expensive tyre wear & improve your fuel economy. Fuel mileage increases as rolling resistance decreases. Total alignment sets all four wheel parallel which, along with proper inflation, minimises rolling resistance. 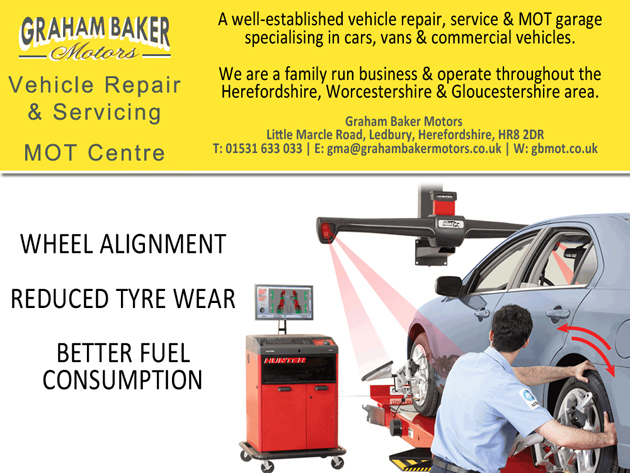 We are your one stop solutions to vehicle repair and servicing in Ledbury, Herefordshire and surrounding counties. Tyres, batteries, bulbs, number plates, vehicle health checks, advanced Hunter 4 wheel alignment, Bosch wiper blades, brakes, air conditioning servicing, Land Rover Autologic performance tuning, Evolution Chips remapping, Ford level diagnostics and much more. When I had an urgent need to repair my vehicle, they acted in an excellent, professional mannerto resolve the problem in quick time. Always explain what they're doing. Even kept old part to show me.